For many, a swimming pool area is just a place to relax by dipping into the water but in truth, that’s not all. It has to be turned into a place where you can also enjoy a beautiful view and with an aura that will make you want to stay in that place for a long time. That’s where swimming pool landscaping with trees comes in. For sure you will agree with me that a pool isn’t just about the water after all. Because of that, it is important to have a lovely pool landscaping. 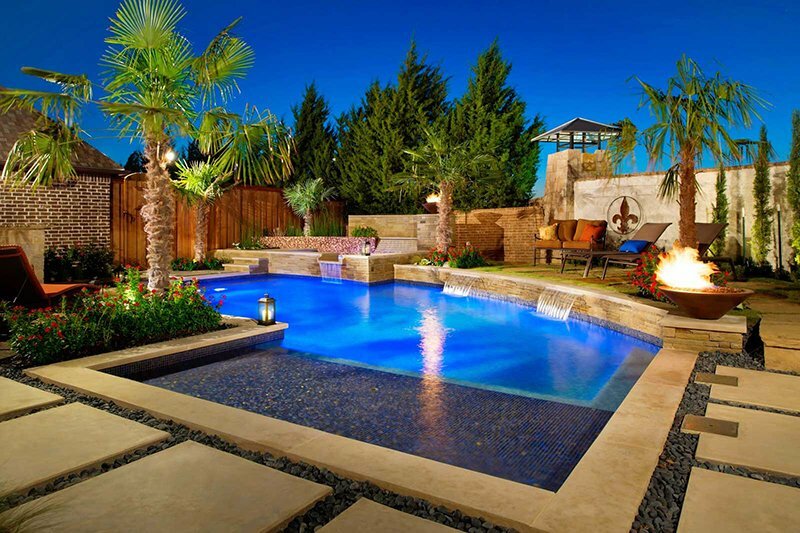 This way, your swimming pool will turn into an oasis and a lush retreat for fun and relaxation. Apart from adding plants of different kinds, we also have to bring in trees to the landscape. But when you do that, make sure to choose trees that can take excessive light and heat. It also needs to tolerate chlorinated or salty water when it is splashed on them. Another thing, the trees should not attract insects because you don’t want to be in the pool with insects around you. With that, you have to choose the kind of trees carefully. Most of the time, you can see palm trees around the swimming pool landscape. Let us take a look at the pool areas below. 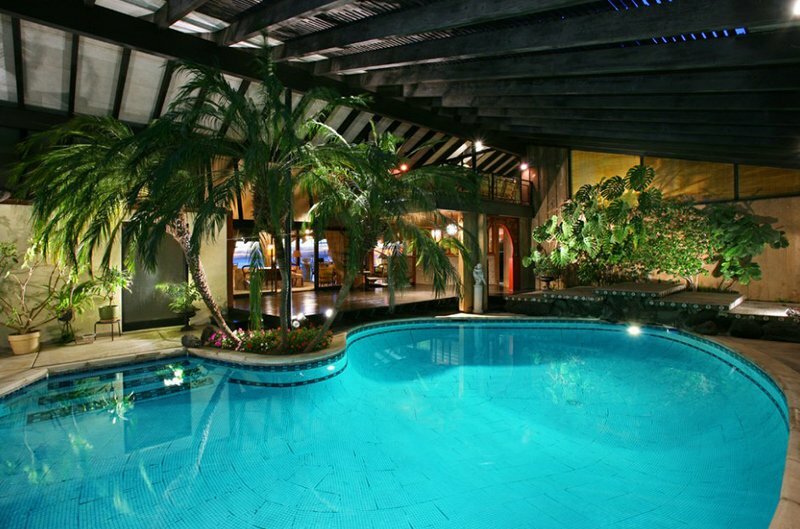 Seen here is an island style indoor custom-shaped pool that has a palm tree in it. It looks like a paradise inside the home! For sure you will agree with me that this pool area has a dramatic and romantic appeal. It has a clean, modern aesthetic which made it more appealing. You can actually add trees of different types around the swimming pool just like this one. With this, you are also adding shade to some parts of the pool. 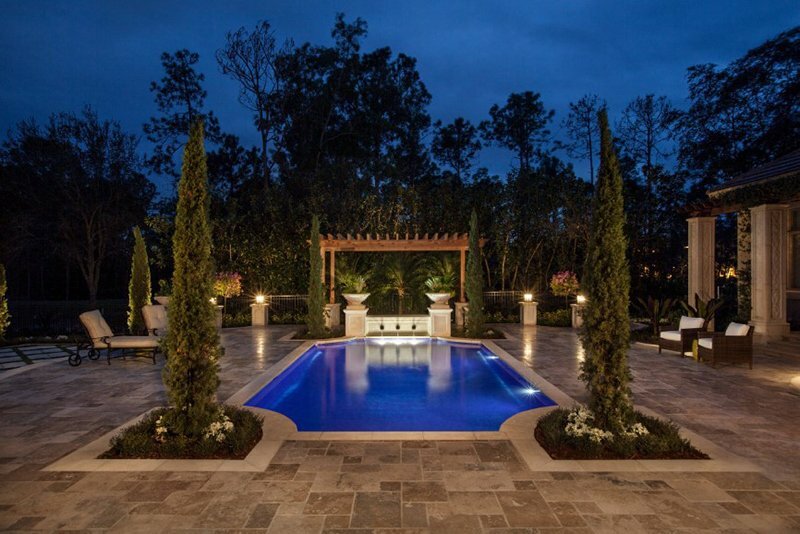 Cedar trees are added around this classical small pool area. And the trees does bring some luxurious touch into the space. Aside from that palm trees, this one also has coconut trees around it. The overall look including the lights is very nice! I’d love to have a pool area like this in my own home. For this one, it has a large tree on just one corner. And as you can see, it does work well for the pool area while providing shade to one part of the pool. Alexander palm trees are used for this pool and I like how these are distributed around it. It is also a good idea to choose these trees because its size is just perfect for the area. 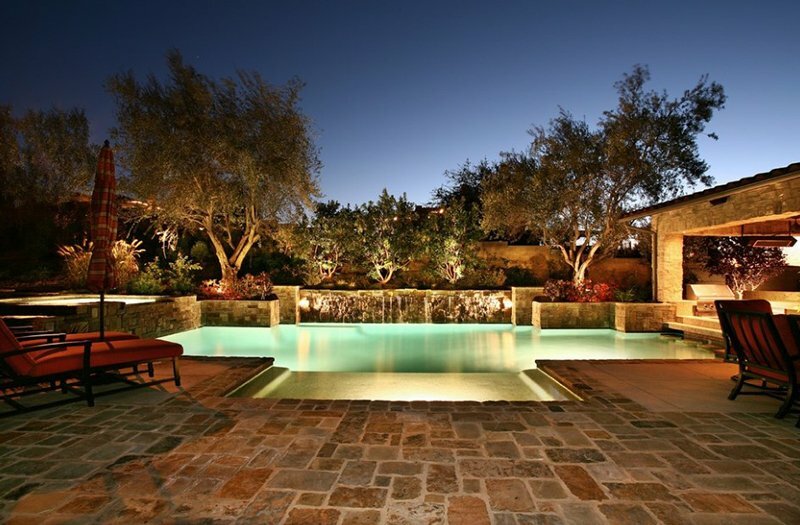 For sure what caught your eye at first glance is the lighting of the pool. But you can also spot here trees of different sizes on the elevated portion around the waters. 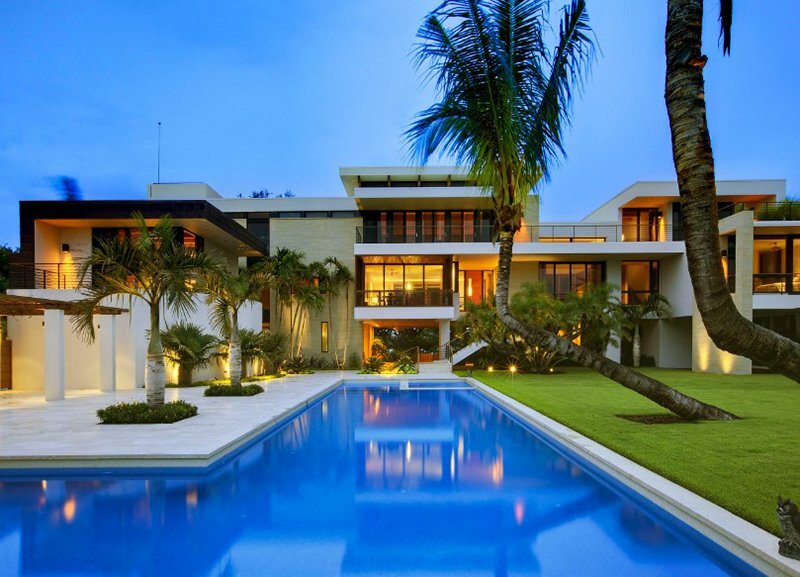 This home has a pool and spa in the outdoor area. Notice that there are trees on the sides of the pool and a bigger tree near the spa. Like the previous pool area, this one also has a spa. 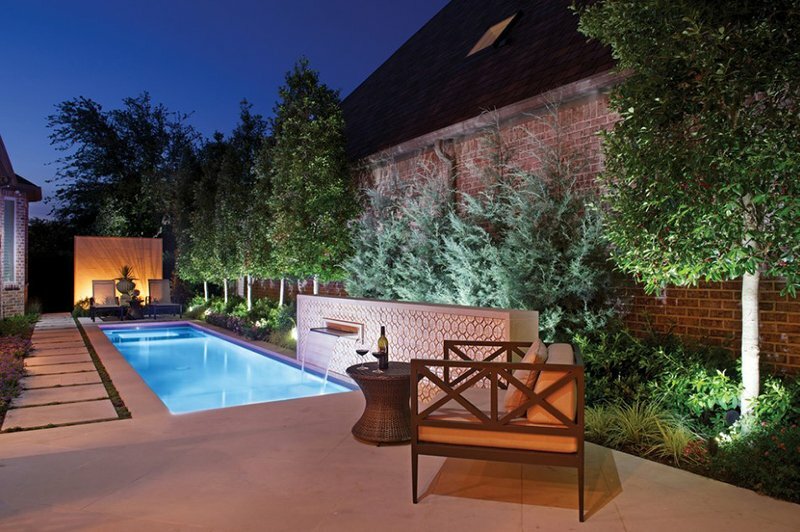 It also features a planter wall that continues its height along the back side of the pool. This provides a platform for pots and also a place for fountains. Isn’t this a stunning home? And the pool area has a beautiful landscape too. Who wouldn’t fall in love with this outdoor space? Adding two trees on the sides of the pool’s pergola seem to frame it. And yes, it does bring a lot of appeal to the area. 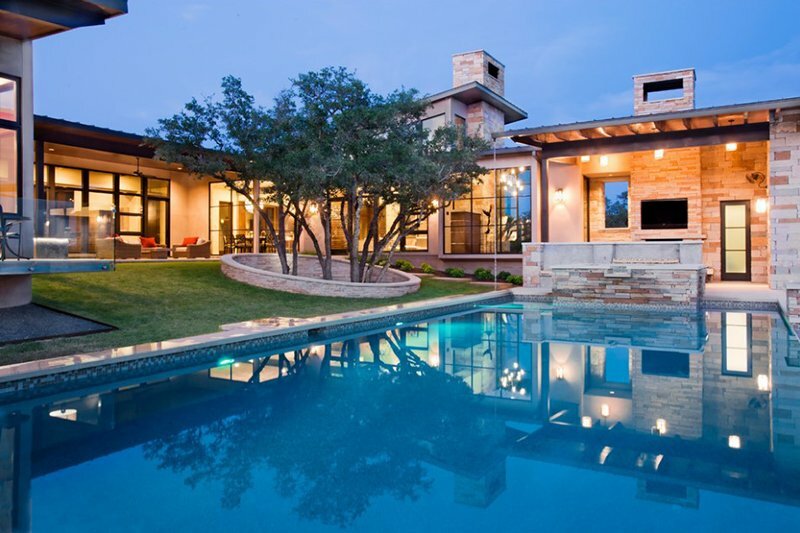 This home offers a sanctuary with private courtyard swimming pool and amazing outdoor spaces. Apparently, what contribute to its outdoor beauty are the plants around it. Isn’t it a nice idea to put trees in one spot? That sloping spot with a concrete circle contains the trees and may double as a bench. This area may not be that spacious but it does look very relaxing. The pool and spa is separated with a sheet of acrylic giving the pool a seamless look. It features a limestone wall that acts as a backdrop for the garden urn which is a focal art in the area. 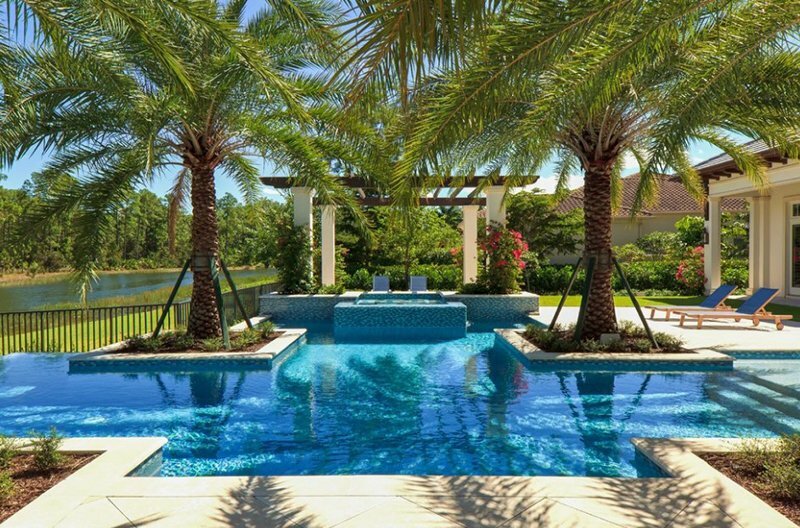 With trees like this, privacy and screening are made possible while creating a beautiful backdrop to the pool area. 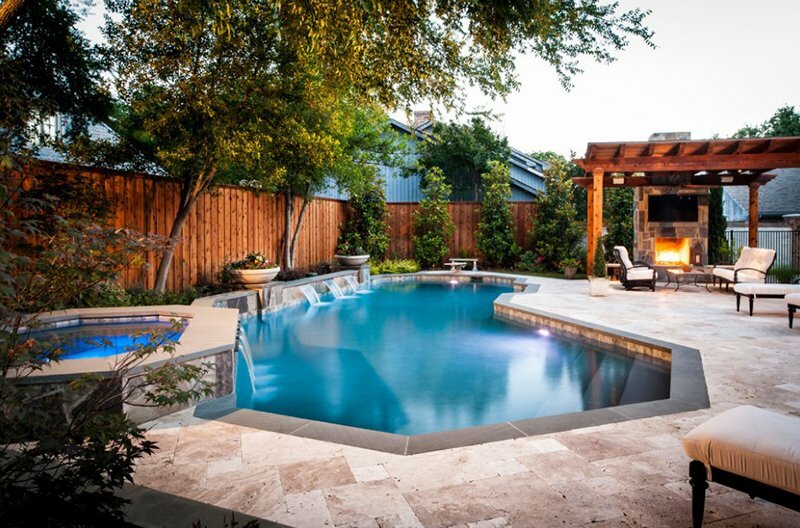 Isn’t this a gorgeous pool area? It is full of dramatic features and it compliments with the design of the house. Nothing really beats an outdoor space with trees! 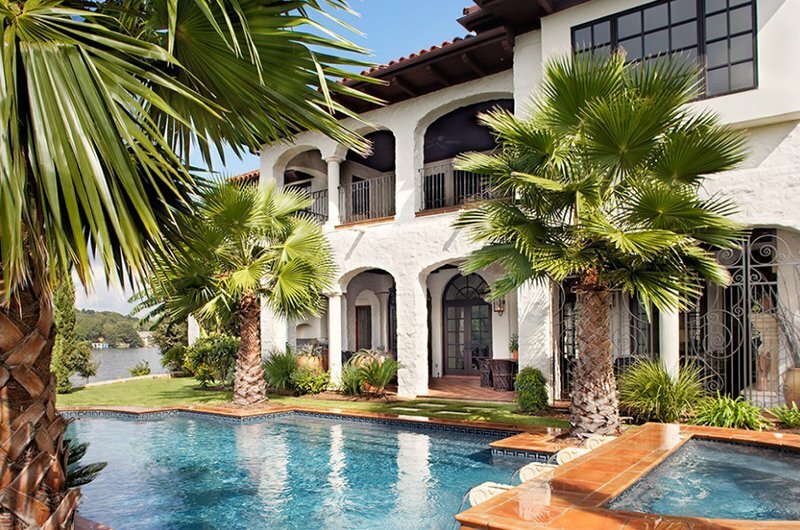 Aside from the palm trees used here, it also has other types of trees around the pool but we cannot deny the beauty that the palm trees bring to the area. Isn’t this a neat decking? It sure looks really nice especially with the trees planted in equal distances. And it also has a pool house which no doubt is every home owner’s dream. 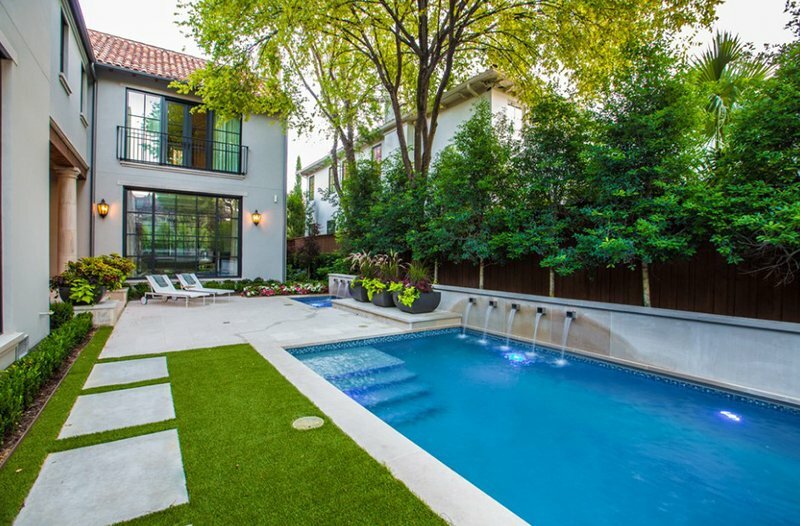 A simple pool area in a modern home is lined with trees on the sides. Apart from defining the space, it also adds beauty to it. 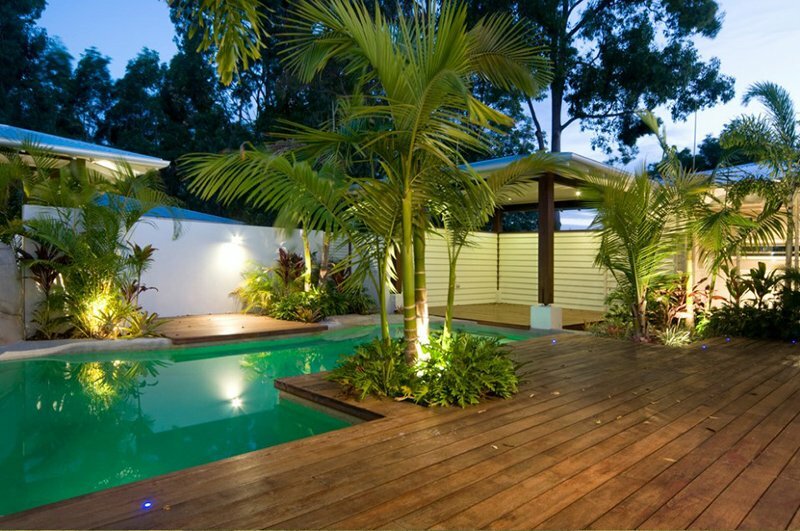 Without a doubt, adding trees to the pool area makes it more relaxing. It also added to the oasis feel of the pool area. Aside from all that, we cannot deny that it brought an appeal to the entire swimming pool landscape. We can see that in the images above. Also, notice that whatever type of pool- may it be modern or classical in style- it would surely look great with trees around it. After seeing the above images, you will no doubt agree!